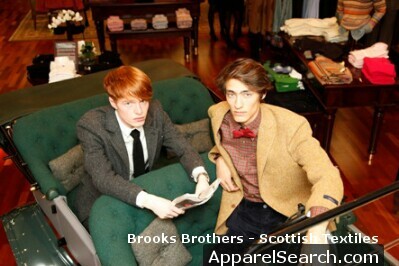 Brooks Brothers – whose customers include Hollywood legends and US Presidents – threw open the doors of its Regent Street store recently (Thursday, October 20, 2011) to showcase the best in Scottish textiles. In a never-before-seen display, the retailer showed off the wealth of Scottish products on sale in its London flagship store to an exclusive guest list of nearly 300 leading lights in the UK fashion industry. Brooks Brothers celebrated its long-standing relationship with leading Scottish textiles companies, which regularly supply the most iconic clothing retailer in the US: Barrie Knitwear; Begg Scotland; Hawick Knitwear; Harris Tweed Hebrides; Harris Tweed Textiles; Johnstons Cashmere; Reid & Taylor, Robert Noble; and Todd & Duncan. To mark Harris Tweed's centenary year, the distinguished retailer – nearing its own 200th anniversary – showed off a Harris Tweed-upholstered 1919 Model T Ford, especially created by Ramsay Coachtrimming for the ‘champagne of fabric's' one-hundredth-year. Guests were invited to immerse themselves in the magic of this century-old cloth, with stunning images by world-renowned photographer Ian Lawson on show, illustrating the rural landscape which is inherent in each piece of fabric that leaves the islands. With notable customers, from Hollywood legends such as Clark Gable and James Stewart to world-renowned artists like Andy Warhol and successive American presidents (including Abraham Lincoln, often pictured in his trademark black frock coat from the store), Brooks Brothers remains one of the world's leading retailers of fine clothing. Cathy Black, head of textiles at Scottish Enterprise, said: "Scottish textiles companies regularly do business with high-end stores such as Brooks Brothers. The fact this well-established retailer has decided to collectively showcase products from Scotland in this way is testament to how much the ‘made in Scotland' accolade means to its discerning customers. "Brooks Brothers' customers want quality, luxurious and stylish products – and that is exactly what the Scottish textiles industry is known for. This is a perfect partnership, and long may it continue." 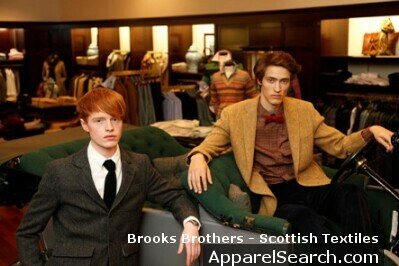 Headquartered on Madison Avenue in Manhattan, Brooks Brothers now boasts 280 stores worldwide and has introduced Scottish fashion to its international customer base. Founder Henry Sands Brooks had a very clear guiding principle for Brooks Brothers, which was "to make and deal only in merchandise of the finest body, to sell it at a fair profit, and to deal with people who seek and appreciate such merchandise." This is a standard echoed by the Scottish textiles industry. Jane McCann, UK general manager at Brooks Brothers, said: "We are proud to celebrate our long-established relationships with Scottish luxury suppliers through this unique event. We welcome the opportunity to showcase the heritage, quality and craftsmanship through our collections sourced from purveyors of fine cashmere, knits and cloth." On arrival, the guests were ‘piped' in to the store by a traditional bagpiper and served a few drams from Tomintoul Whisky provided by Angus Dundee Distillers, and canapés were served by kilted waiters while guests were entertained by a live traditional ceilidh band. Twenty per cent of the evening's sales were donated by Brooks Brothers to its nominated charity, ORCHID – which offers support services, education and awareness campaigns to fight male cancer. As well as the proceeds of the evening's sales, raffle tickets were also sold in aid of ORCHID, with prizes such as a luxury Scottish break for two, a Brooks Brothers Harris tweed jacket and other luxury Brooks Brothers Scottish garments. Famed for a number of firsts, Brooks Brothers has introduced many pieces such as Ready-to-Wear clothing and the iconic Polo Button-Down Shirt to America, which are now a staple in the fashion market. In addition to the ‘ready-to-wear' suit, the company is also credited with the introduction of the Wash-and-Wear Shirts (first made in the 1950s using a blend of Dacron, polyester, and cotton called "Brooksweave"), and the much loved Non-iron Cotton Dress Shirts, made from 100% cotton, thanks to its innovative development of technology. The button-down dress shirt collar was developed by founder Henry Sands Brooks' grandson John E. after he saw the non-flapping collars on English polo players at a polo match in England. Brooks Brothers also supplied clothes for the television show, Mad Men. Chuck Bass and Nate Archibald, characters on hit teen drama Gossip Girl, as well many of the Glee characters, all frequently wear clothes from Brooks Brothers. Textiles Scotland was established by the Scottish Textile Industry Association (STIA) to increase awareness of the scope and scale of businesses involved in the Scottish textiles and fashion industry. This brand has been created to represent Scottish interests at international events and provide a single point of contact for the industry. Textiles Scotland holds regular forums on industry issues and opportunities that help to determine its future. Founded in 1818, Brooks Brothers has a heritage deeply rooted in American history. As the country's longest-established clothing retailer, Brooks Brothers has played a definitive role in shaping American Style for nearly two centuries. In addition, Brooks Brothers is passionate about the quality and value found in our "Own Make" products, and is proud to manufacture our ties in New York, shirts in North Carolina and suiting at Southwick in Haverhill, Massachusetts. Orchid is the only UK registered cancer charity to focus entirely on the male-specific cancers: prostate, penile and testicular. The charity offers support and information to people affected by male cancer through a range of support services, education and awareness campaigns and Orchid funds an innovative and cutting-edge world class research programme. Over 37,000 men will be diagnosed with a male-specific cancer this year.